ColdPruf Classic 100% Merino base layers, “cost effective, yet high performance base layer that’s not going to take up too much space or weight”. Practical Travel Gear checks out some ColdPruf base layers! YADKINVILLE, NC – Dec. 4, 2014 – ColdPruf base layers today announced availability of its pro-purchase program for the 2014 / 2015 winter season. The company’s “ColdPruf Experience Pro-Buy” program allows qualified individuals to purchase ColdPruf performance base layers 50 percent off retail prices. ColdPruf has improved access to its Pro-Buy program by offering a streamlined, one-step online application process. Access codes to the site may also be obtained via Pro-Buy cards that will be distributed by the ColdPruf sales team during clinics and trade shows. The ColdPruf Experience Pro-Buy program is open to qualified outdoor industry members, such as outdoor retail employees, ski patrollers, search and rescue personnel, guides, instructors, environmental professionals, field-based government employees and outdoor media and photographers. 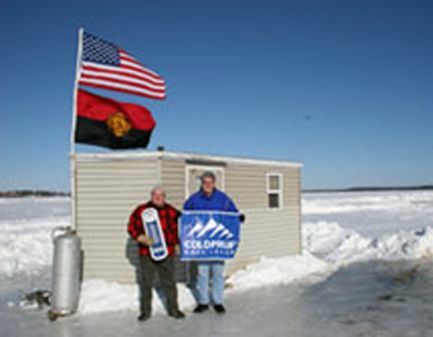 To apply for the ColdPruf Pro-Buy program, go to coldpruf.com/partnerincentives. For more information call 800-334-8605. ColdPruf – We Own Cold™. Our base layer products prepare you for any forecast, any activity. Manufactured by North Carolina-based parent company, Indera Mills, ColdPruf base layer products promise the quality and dependability you’d expect from a century-old company, without compromising the look, feel and technical demands of today’s active consumer (www.coldpruf.com). 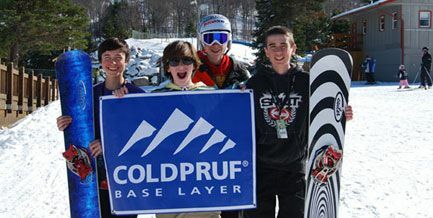 COLDPRUF Base Layer is a very proud sponsor of the Camelback Ski Team. To learn more about the Camelback Ski Team visit their website at www.camelbackskiteam.com. YADKINVILLE, N.C. (December 30, 2012) – Entering 2013, North-Carolina based base layer apparel manufacturer, ColdPruf, is evolving its brand identity to one that’s focused on preparing you for any outdoor activity, no matter how low the temperature drops or how hard the wind blows. Just as the weather changes, so does ColdPruf®; ever adapting to fit the warmth and performance needs of casual to active consumers alike. In short, ColdPruf gets you ready. Partnering with Winston-Salem agency, Woodbine, ColdPruf’s initial rebranding is being introduced through ColdPruf’s new website and the debut of the manufacturer’s 2013 catalog. One feature of the new branding includes an increased focus on ColdPruf’s proprietary ThermaChoice® System which makes the sometimes daunting task of finding the right base layer easy. While the new brand positioning adapts the personality of ColdPruf in terms of where you might find ColdPruf in the midst of your day; you can expect the continued detail and attention to design, knitting and finishing that was established by 99-year-old parent company, Indera Mills. Now in it’s fourth year of manufacturing, ColdPruf is balancing a focus on athletic performance with both work and casual base layer needs. Throughout 2013 new branding will be expanded beyond digital to trade show, public relations and point of sale. ColdPruf is always seeking to expand distribution. For distributor and retailer inquiries, visit us at Outdoor Retailer booth #34159 , or contact Peggy Denomme at 800.334.8605 x600 or pdenomme@coldpruf.com. The boys pictured are members of the Camelback Mountain School (CMS) – Rhodo Team (youth athletes). Chandler Samuels is ranked #1 in East Coast Mid-Atlantic youth men headed out to nationals in Giant Slalom and Slalom. The CMS school has approximately 25 athletes headed to Copper Mountain in Colorado to compete in the USASA (United States of American Snowboarding Association). YADKINVILLE, NC – June 26, 2015 – Indera Mills, Parent Company of ColdPruf Base Layer, today announced the expansion of their logistics facilities with the addition of a new warehouse. The new building will add 50,000 square feet of warehouse space to complement the company’s existing logistics facilities. Construction of the new warehouse is underway and will be completed by August 1, 2015. The new facility will allow ColdPruf to increase inventory in order to accommodate the growth of the ColdPruf brand and ensure product is available for on-time delivery year round. The new building will also adhere to Indera Mills’ / ColdPrufs’ “Green Initiatives” standards by implementing energy efficient light fixtures, automatic climate control and recycling programs. ColdPruf is providing regular updates to the warehouse construction via their social media platforms. Fans of ColdPruf can view pictures of the warehouse construction on the ColdPruf Facebook, Twitter and Instagram pages. YADKINVILLE, N.C. – December 18, 2012 – As outdoor buyers, retailers, media and enthusiasts make the annual trip to Outdoor Retailer Winter Market in Salt Lake City, Utah, they will once again be greeted by ColdPruf as the 2013 Official Base Layer of Outdoor Retailer. This year’s Winter Market will be eventful for ColdPruf who will reveal new branding, new products and new sustainable, environmentally-friendly product features. Known for showcasing quality brands, cutting edge technologies and emerging trends, Outdoor Retailer Winter Market attracts more than 20,000 attendees each year. The show also marks the official launch of the brand’s new Premium Performance base layers, a further expansion of the company’s growing range of performance base layers. Show attendees will be the first to see and feel Premium Performance products, lightweight first layers intended for athletes and sportsmen whose medium to high level activities necessitate performance polyester’s superior moisture wicking capabilities combined with the subtle support and movement of spandex. Premium Performance base layers also feature Microban® protection, added to garments during the manufacturing process, to ensure maximum dryness and antimicrobial odor-control protection. * MICROBAN is a registered trademark of Microban Products Company. 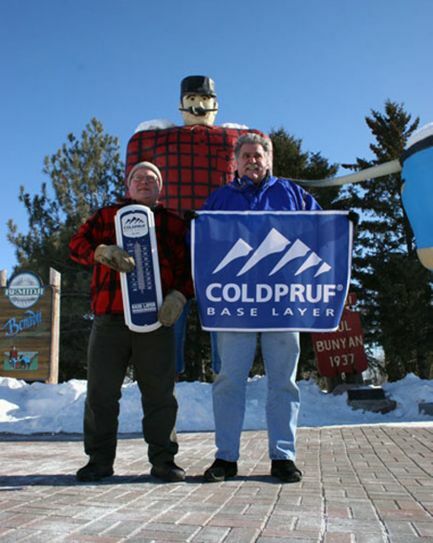 YADKINVILLE, N.C. (January 1, 2013) – North Carolina-based base layer manufacturer, ColdPruf, announced today the latest expansion to the company’s growing product line with the addition of the Premium PerformanceTM layer. Backed by 99-year-old parent company, Indera Mills, ColdPruf adds the new active layer to a group of two other performance products. While the entire trio of products offers superior warmth for high-intensity activities, Premium Performance provides consumers a trimmer style for activities where comfort and fit are priority. The Premium Performance layer delivers to active consumers a single-layer garment with maximum dryness and antimicrobial odor-control properties, all while offering a more trim and contoured fit. Additionally, the Premium Performance layer will be the latest ColdPruf product to feature Microban® antimicrobial protection. The integration of Microban, which helps to prevent the growth of odor-causing bacteria and keeps fabric cleaner and fresher longer, adds to the performance quality of the new style. Offered in both men and women’s styles, the Premium Performance layer will initially be revealed at the Outdoor Retailer Winter Market January 23. Available in Men’s Black, sizes S-2XL and Ladies’ Black, Cranberry and White, sizes S-2XL. Crew top and pant sold separately. MSRP: $27. *Microban is a registered trademark of Microban Products Company. All rights reserved. 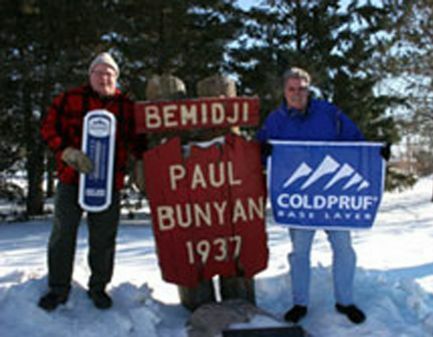 COLDPRUF sales rep Han Buslee visits Bemidji Woolen Mills buyer, Bill Batchelder in Bemidji, MN.. Relax, stay warm with COLDPRUF Base Layer – we’ve got you covered! © 2019 COLDPRUF. All rights reserved.